White_Strathmore_Envelopes__Paper is rated 4.8 out of 5 by 41. Rated 5 out of 5 by KnoxGraphicsDesigns from Great Qualty, Very Happy! First Order and Wasn't Sure How They Would Be But The Quality Was Spot On and Printed Great! Rated 4 out of 5 by LDM79 from It works! I honestly expected more for the price, hoping the wax doesn't seep through the envelope. Doesn't look like a bright white ( I compared to another brand). Do you offer the ability to have a return address printed on the envelope? What is the sub. weight for the Strathmore Bright White Wove for the A-10 &amp; 9 x 12 booklet Envelopes ? Both paper weights are at 32 lbs. difference between wove and laid? Wove has a smooth finish to it while our laid has a texture to it (horizontal lines). Do you have cards that match this color and size? Because of this very specific size, we unfortunately do not have cards that go along with. Do you have 150 of these in stock? Do you have any other A-10 &quot;bright&quot; white text envelopes in stock? Hello! Yes, we do have these Strathmore Bright White Wove A10 Envelopes in stock at this time. Thanks for the question! Just when you thought white was simple, White Strathmore Envelopes are more than what you would expect. They are our most requested envelopes because of their quality, versatility, and elegance. They come in over 20 sizes, a huge selection of styles and versions of white, and several different flap shapes. The choices are pretty much endless. Giving new meaning to the basic white envelope. Strathmore Envelopes are created with certified renewable energy. The paper used to make them has a heavy rich quality, for value you can see just by looking at them. In the range of options offered, there is a Strathmore Envelope for every event, both social and business. Strathmore envelopes can be used to send large direct mail. They can also suit any aspect of an elegant wedding: Response cards, save-the-dates, thank you notes, invitations, and table seatings. Strathmore Wove & Laid Envelopes are 25% cotton and come in Bright White and Natural White. Strathmore Pinstripe Recycled Envelopes are made from 30% post consumer waste and are available in Bright White & Natural White. 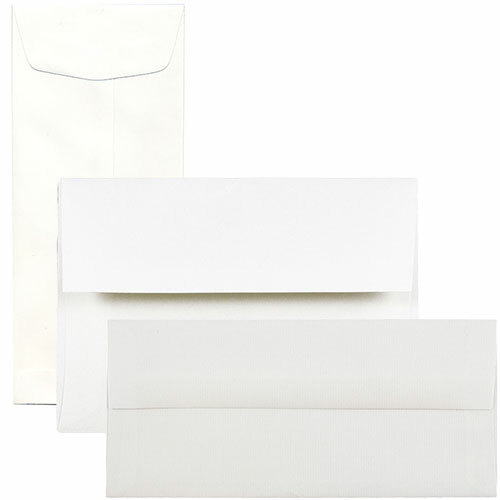 Via Linen Recycled Envelopes are made from 30% post consumer waste and are available in Bright White & Natural White. 3 Drug, 3 ½ x 5, 3 1/8 x 3 1/8, 4 Bar, Monarch (3 7/8 x 7 1/2), A2, A6, A7, A8, A10, #9, #10, #10 Window, #10 Policy, #11 Policy, #12 Policy, #14 Policy, 5 ¼ x 5 ¼, 6 x 6, 8 1/2 x 8 1/2, 9 x 12 Booklet, 9 1/2 x 12 5/8, & 10 x 13 Booklet.